I do apologize for not keep this up-to-date but between being very busy and often being in places that do not offer good (or affordable) internet I have fallen an entire ocean+ behind. We are now in Richards Bay, South Africa but I will tell the story in chronological order because that is easiest for my simple mind. The last posting got us as far as Bali but did not really cover the island at all. A few Bali comments are in order. First, it is not at all like the romanticized image we have of it. 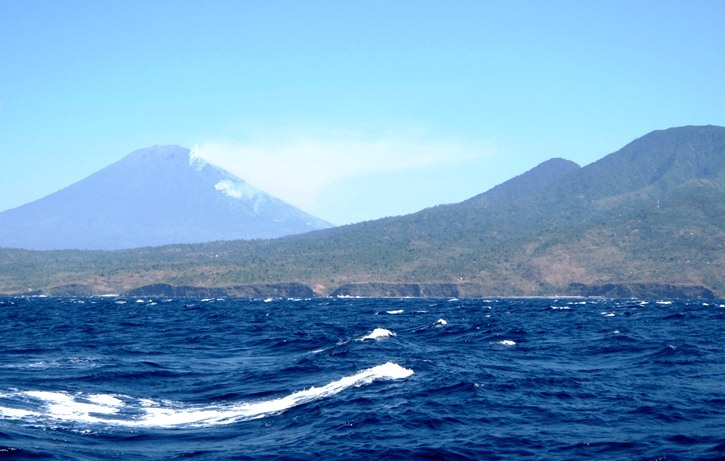 The island itself is quite beautiful with high mountains and even a smoking volcano. Secondly, it is not like the rest of Indonesia. The population is largely of Indian ancestry and hence Hindu. Add to this the fact that there are still many Moslems and a big expat and tourist presence and it is a very busy, interesting place. Traffic can be terrible with many cars and trucks and an incredible number of small motorcycles There are dozens of large hotels and it surely must rank as one of the world's largest tourist destinations with huge numbers of Aussies and Europeans - when you wander down the street of the tourist area there are restaurants advertising Foster's beer and 'great tucker', that have satellite TV showing foreign sports. Perhaps it would be best to describe it as an interesting place - if not an entirely pleasant one. To get to the harbour in Bali you have to pass through the strait between Bali and Lombok. Currents can be strong, although they tend to be favourable if you are heading south and there are lots of big ships, including supertankers. Smoking volcano is in the back. For our Indian Ocean crossing we had, for the first time, crew. Wynne is American and Kristian is German and they turned out to be competent crew and pleasant companions. They had experience on tall ships in the US and had crewed across the Pacific. Before joining us they had been volunteering in a remote village in Laos. After reaching South Africa they plan to find a sailboat (perhaps a delivery) to Europe, before settling down to a more 'normal' existence in the US. Wynne was waiting to hear about acceptance for a PhD program while Kristian would be finishing the editting of his second novel (first draft completed on the voyage) and looking at job and educational options. From Bali our first stop was to be at Christmas Island which is an Australian possession about 530 miles away. The Aussies have demonstrated some common sense here by not having the ridiculous $330 quarantine fee that they have on the mainland. All you need is a visa (ours had run out and we were able to get one online in Indonesia. You also have to send them an email at least 96 hours before arrival to say you are coming. This short passage went very well. We had an unusual second day. We picked up a terrific current and were moving at 8.5 to 9.5 knots. The problem was that this pace was going to get us there in the early part of the night, and I am never comfortable going into a strange harbour (or anchorage) in the dark - although in this case we could have done so. Anyway, I decided that we needed to slow down which was a bummer because we were going so fast and comfortably. Even with 11 hours of slowing down we still did 183 miles for the day. Without slowing down I suspect we would have had about a 210 mile day which is 17 miles more than our best ever. Oh well. We managed to get to the island at about 7 am which is what we wanted. The bottom there is very rocky and deep and the government have banned anchoring to protect the coral. Instead they have installed about six very good moorings which was helpful. 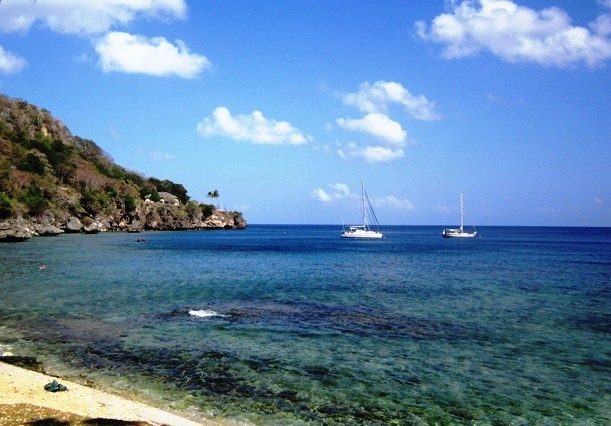 This is the anchorage (actually mooring field) at Christmas Island. We are on the right with Beach House, an American catamaran next to us. The economy of Christmas seems to be based on two industries. The first is the mining of phosphate rock. During our time there two relatively small freighters loaded. The process took less than a day. The other 'industry' is dealing with illegal immigrants, largely from Indonesia, although others are from countries like Pakistan and Afghanistan. The immigration officer we talked to said that it is not unusual for some of these people to have first class stickers on their luggage from their flight from home to Indonesia. There is a large detention camp on Christmas that holds a couple of thousand asylum seekers, although just when we were there the government passed a new law that would have most of these people held in camps in Malaysia and Niue (a now mined-out phosphate rock island in the Pacific). Most refugees are granted admission to Australia but it can take several years for the processing. 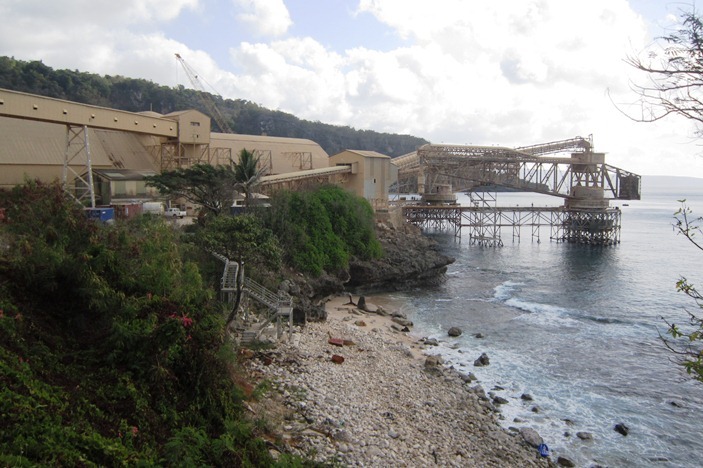 The phosphate loading dock is critical to the economic health of Christmas Island. There is no dock as such. Freighters merely tie to a series of large mooring buoys. They have done a very nice job hiding the mining infrastructure, except for this dock of course. 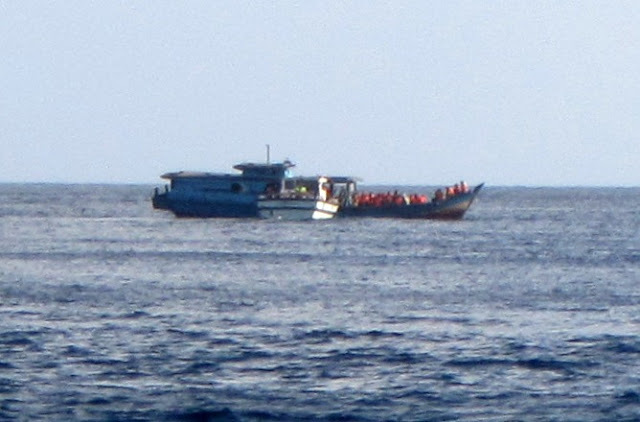 When we were at Christmas the Australian navy 'caught' an asylum-seekers boat. I say 'caught' with tongue firmly in cheek because they want to get caught and will often call on the radio to give their location. This boat had about 60 people on it who were taken ashore on a couple of the local boats (one seen here). There is no crew on these vessels. The smugglers buy a cheap vessel in Indonesia, show the people on board how the engines work and how to use a handheld GPS and send them on the their way. Last year one of these vessels ran into the rocks around the island and 100 people drowned. The navy burn the smuggling ships after removing fuel and other dangerous materials. Christmas Island had a very nice community feel, although judging by the size of the liquor department at all of the grocery stores, I suspect it might get a little boring. Prices are very high though since most things are flown in. A nice Chinese cabbage, for example, was $12!! Our inner stay arrived by air and cost $200 for shipping from Perth (it weighed something like 7 pounds).. They have a permanent outdoor movie theatre that shows a newish film every Saturday night.We went and saw the most recent Batman film. 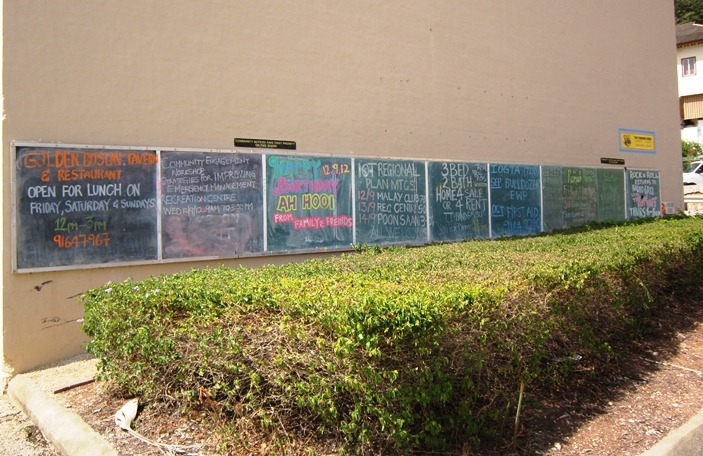 There are a couple of sets of blackboards like this in the centre of Christmas. They had everything on them from what movie was showing on Saturday to what the specials were in the restaurants and who had a house to rent. There also was an island radio station. Pretty good for an island of 1400 people. We had a chat with the owner of the hardware store whose daughter was running in the New York marathon. The whole family was going to cheer her on and the island got behind her since she was raising money for cancer research. Not sure what happened when the race was called off because of Hurricane Sandy. Posted by Bruce at 11:30 a.m.